I’ve suffered from low self-esteem for since I was at least 14, something which manifested itself first in the form of anorexia followed by alcoholic binges, depression and panic attacks. Over ten years later I still have a curious relationship with food and often feel that I cannot go on any more; due to issues in the past, I have made a personal decision to avoid antidepressants however at times I do wish I could just take a pill that would block out any feeling at all. Luckily I have had (and still have) a great deal of support from my family – my mother – and my friends. I have made it through the other side of the darkest days. This doesn’t mean I don’t still have difficult days and there are still times when I cannot go outside without shaking with fear, but I now know how to deal with these things enough to get through the day. I would like to believe that a time will come when societal pressures are lessened – when young people aren’t faced with the over manipulated figures of the ‘desirable’ on a daily basis. When people can be their natural shape and not feel the need to starve themselves to be skinny. We do not need to change ourselves to be beautiful, but we do need society to change to accept that beautiful comes in all shapes and sizes. I want to share my experiences in the hope that they will help others through difficult times. It is important to know that you are not alone. My hope is that these t-shirts will remind whoever is wearing them that they are awesome. I am one of the minds behind the self-esTEEM project. 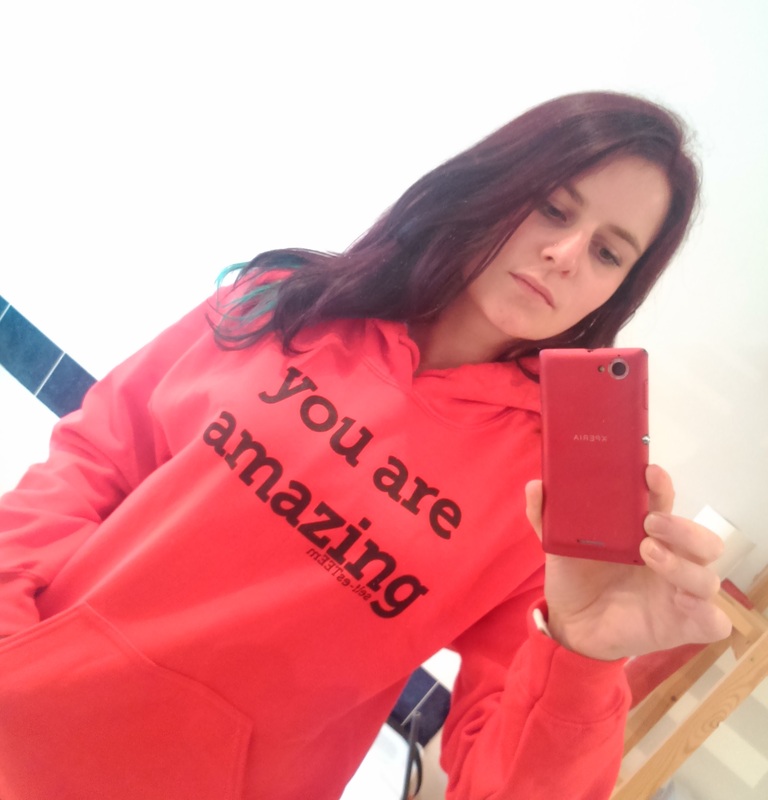 My dear – you truly are an amazing woman! Incredible talent, a creative mind and the courage to face your fears. Please, realize you also have the support of your friends! No – I see what is there! I’ve known you for over 5 years, and have always admired your talent and creativity! We all have demons, but not all of us face them – I know it’s very scary, just don’t give up. It is important to remove the stigma. Well done. Truth be told I’m still there in many ways despite portraying the me I’d like to be, to people I encounter on a daily basis. I thought that losing weight would help and have managed to lose 7 stone this year. Does it make me any happier in myself than I was before? No. Actually not in the slightest. Now I just see more imperfections. I admire the stand you’ve taken and will fight shoulder to shoulder with you whenever I can. Good for you Holly, hope to see you again soon. Brendon, thank you so much for your message. I’m sorry that losing weight hasn’t helped, but it does just go to show that it is something inside yourself which causes the issues. I’ve still got them even though, like you, I like to pretend I haven’t. It’s hard. The best thing to hope for is a bit of support and some sunny days, and people who can give you a shoulder if you need one.